Firstly, I'd like to clarify that this post has absolutely nothing to do with Sconegate. No, really, it hasn't. I am SO over it. It's so last week. Well okay, when I've finally had the chance to whine about it to my favourite whining buddy, then I'll get over it. But he's recently had an earful of me whining about a wide variety of other subjects and so I'll save it up for a day when the whining potential over other annoyances is low. Actually, the purpose of tonight's recipe was a test run for a little idea that's been bubbling away at the back of my brain for a few days so I decided to give this one element of it a whirl. 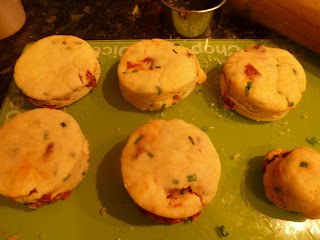 I'm not sure why, but I've become obsessed with the idea of adding chorizo to scones. Given that it's the most commonly used meat-related product so far on this blog, I'm not surprised. And the recipe encompasses baking and cheese which also feature at the top of the tag cloud, so what's not to like? Of course me being me, I have this thing about sharing my own recipes in public. When it comes to food, I'm a follower. I'm not very good on the ideation* front. I'd much rather take a recipe and tweak it than invent something from scratch. Then again, as I've said before, do any of us really make a completely new recipe from scratch? There are certain rules of science in cooking that mean deviation from them just leads to disaster. Many people try to tinker with cake, but most cakes are based on the pound cake principle. Or very slight variations of that basic rule of thumb. Take my scones. You can't fiddle around too much with the basic recipe because either they don't bake properly or the end result isn't actually a scone. 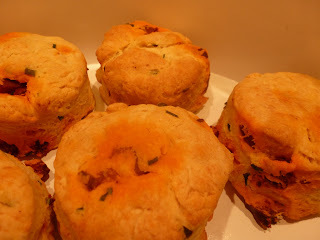 So although I say it's my recipe, it's really someone else's cheese scone recipe which I found many moons ago that I've now tinkered with to get to this point. But chorizo was a bit of a revelation for me. I not only like the flavour in this recipe, I love the way the paprika leaches into the dough and gives you pretty orange streaks. Thyme seems to be the classic herb to go with chorizo, but I decided to buck that trend, both for the contrast between the orange and green; and moreso because it gave a lovely alliteration to the title. Cheese, Chive and Chorizo. So here is a recipe from me to you. Give it a go. Tweak it if you like with different varieties of cheese or herbs. They're great fresh from the oven and I think they're better warmed back up than eaten cold. If you give it a go, let me know what you think. All natural and home made. With nary a jot of wallpaper paste in site. 225g self raising flour plus extra for dusting. Preheat the oven to 220c/200c fan/gas 5. Place a baking sheet in the oven to warm. Put the flour and butter into a bowl and rub together until it resembles fine breadcrumbs. 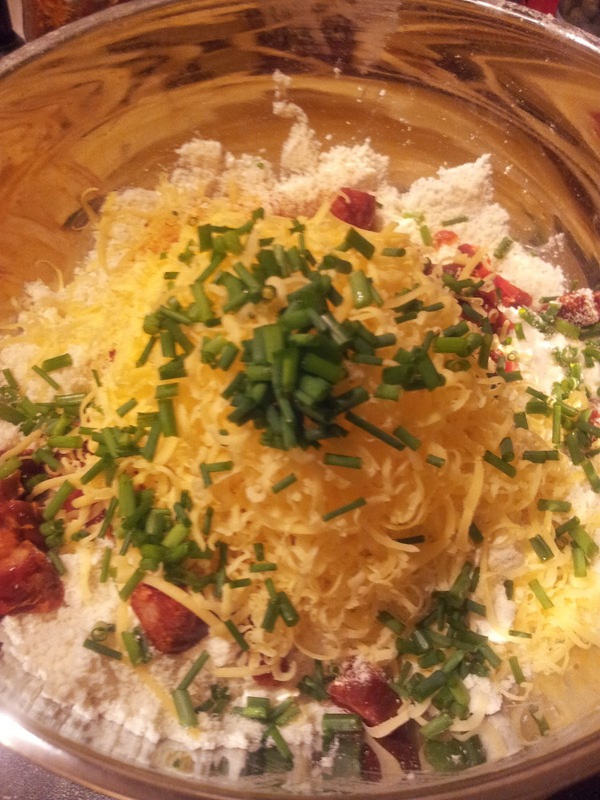 Add the cheese, chorizo, cayenne and chives and mix thoroughly. Place the dough onto a floured board and pat to about 2cm thick. Cut into rounds using a 5cm cutter. Use all the dough up by forming back gently into a mound and patting and cutting again. Remove the baking tray from the oven and place the scones on the tray. Brush the tops with egg or milk (I forgot this bit) and bake for 15-20 minutes until risen and golden. Serve warm with lashings of butter. *I recently had to take my mentor to task over his excessive use of management buzzwords. He's got this nasty habit of slipping them into a meeting when we're trying to be deadly serious and distracting me from the very important task in hand because I have to stifle a giggle or several. Take the word 'mandrolic'. He said it once and suddenly the entire company seemed to be saying it. It means a long-winded, tedious, manual task. Just the use of it makes me cringe and the whining factor ramps right up whenever I hear it. What's wrong with 'manual'? He has now made it his mission to track down the most ridiculous and random use of words and emails me from whatever presentation he's in with his latest find. 'Ideation' is apparently short-hand for 'Idea Generation'. Or just people getting sloppy with their speaking if you ask me. Mmmm I fancy these for tea!